Have you ever considered turning your passion into your job? Have you ever wondered what’s involved in doing that and where to start? Here’s your opportunity to find out! 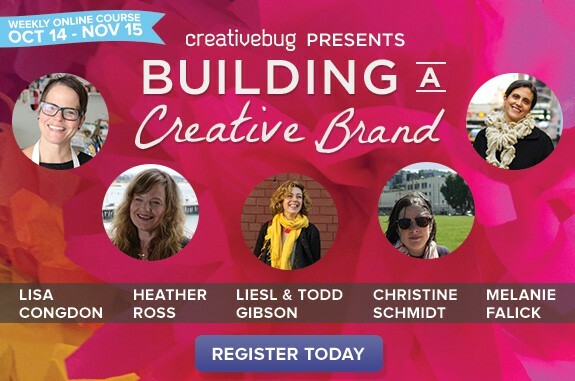 We’re excited to announce our participation in a special new course series from our friends at Creativebug, Building a Creative Brand. During the series, you’ll get straight talk, inspiration and advice on the fundamental aspects of building and elevating a creative brand. From finding the essence of your brand and business basics, to licensing and book publishing this series is for any aspiring creative person. The course features weekly video classes, downloads, and live chats with each of the people featured in the series. You can get full information on the course series on the Creativebug site. Here’s a preview. Early bird pricing is available until October 7, and Creativebug members get an extra discount. With their special $9.99 per month subscription offer available through the end of September, you’ll get a super deal if you purchase a new subscription and take advantage of the early bird discount right away. We hope to see you on-line in October!